Quinoa Tabbouleh Salad. If you have been following this blog a while, you have probably heard me mention that my mother in law is from Turkey. I have several of her recipes on my blog including my super easy bean salad and my red lentil soup. Tabouleh salad is another thing she makes often. 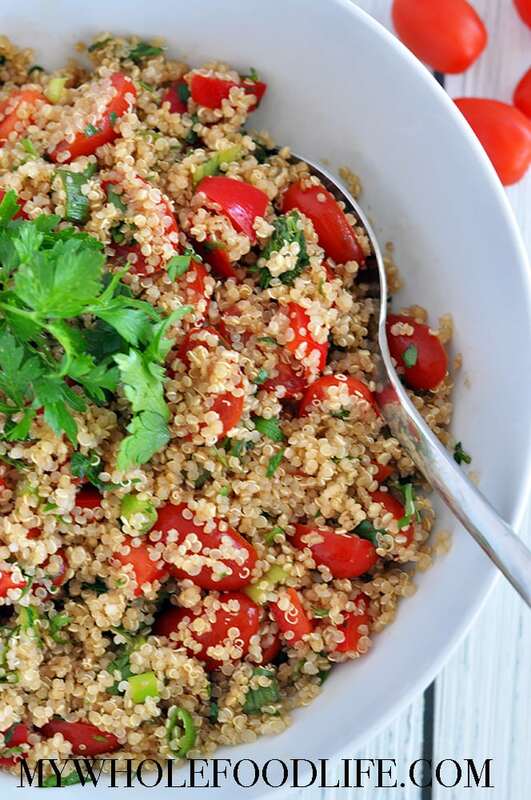 Traditionally, tabbouleh salad recipes are made with bulgur. Bulgur is not gluten free though. 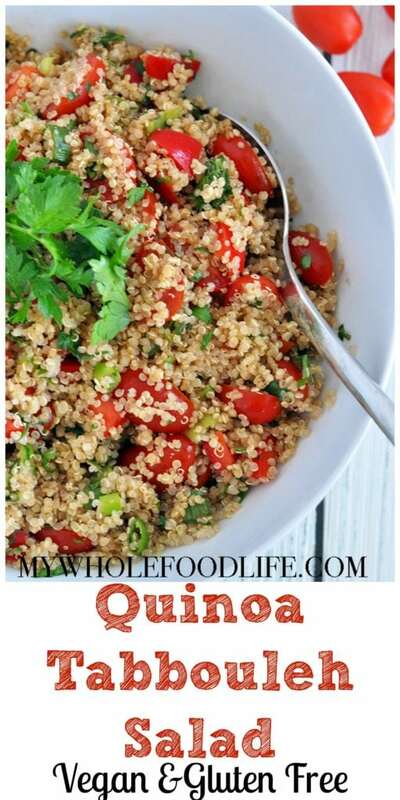 I wanted to keep my tabbouleh salad gluten free, so I used quinoa instead. 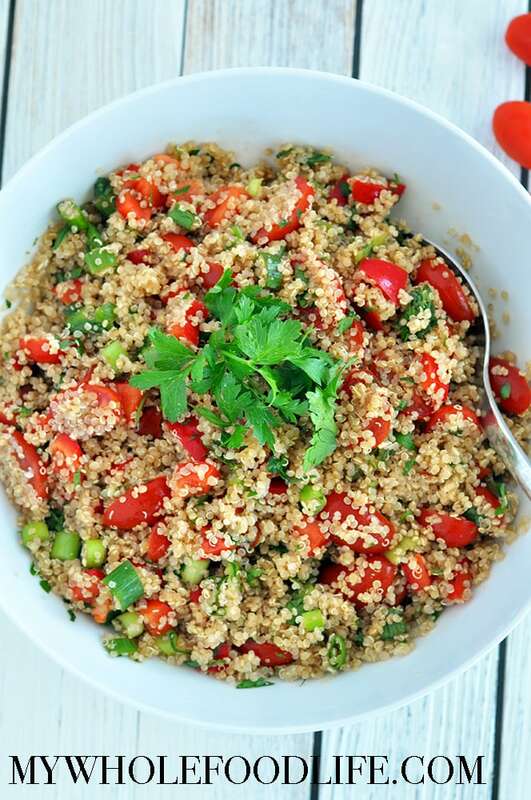 This tabbouleh salad is super simple to make and it will keep you full for a long time. 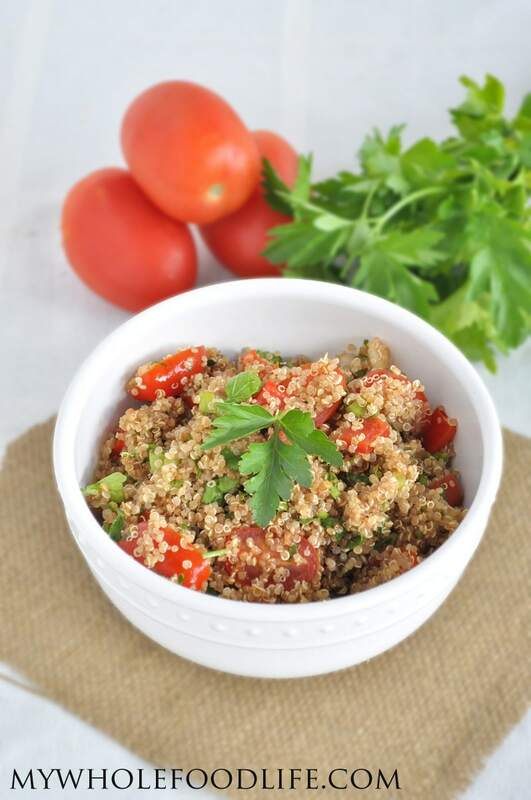 This tabbouleh salad recipe is also very adaptable to add in whatever other veggies you may like. You can eat this on it’s own, or mix in a wrap with some greens and hummus. Yum! Bring to a boil, then turn down, cover, and simmer until all the water is absorbed. It usually takes about 10 minutes. Once the quinoa is cooled, add it and the remaining ingredients to a bowl and mix well. This quinoa tabouleh should last in the fridge for at least a week. Enjoy! I'm anxious to try this but I have a question. I've never used pomegranate molasses - is there a substitute? Could I use olive oil instead? Thanks! You can use olive oil instead, but the pomegranate molasses gives it a unique flavor. HI, where would one fine pomegranate molasses? You can find it at most health food stores in the same section as the oil and vinegar. I love quinoa! Thanks for the great recipe! I hope you enjoy my version. I do think that the pomegranate molasses really adds great flavor to it. Love this! I added cucumber too. I used olive oil and just a tsp of regular molassess for sweetness. Yum! What's the calories, fat, carb for a serving ? What is the serving ? Thank you for this! Does it matter if it's flat parsley or the curly one? I like the flat leaf parsley for this recipe.